It was roughly a year ago that we had a chance to review Dell’s XPS 13, which was the first laptop from Dell to feature the Infinity Edge display. In addition to making the laptop look as much like a bezel-less display as possible, it also let Dell squeeze a 13-inch laptop into a much smaller chassis. The XPS 13 is still, to this day, unparalleled in the PC space in this context. So the obvious question at the time was when or if Dell was going to do the same to the rest of the XPS lineup? That question was answered in October 2015, when Dell launched the updated XPS 15 with Skylake and Infinity Edge. Just like the XPS 13 before it, the laptop was bezel-less and the larger 15.6-inch model fits into a laptop chassis that would normally house a 14-inch display. Smaller, lighter, and with the same styling as the XPS 13, Dell has the potential to set the bar higher in the larger laptop segment as well. With the updated chassis also came an update in the internals. Dell moved to Skylake for the 9550 model, with Core i3, i5, and i7 models based on Intel’s H Series chips. The Core i3-6100H is a dual-core 35-Watt CPU, and the Core i5 and i7 are both quad-core 45-Watt processors. The base RAM option is 8 GB of DDR4, and you can order up to 16 GB from Dell, although this laptop does have SODIMM slots so you can add up to 32 GB if needed. Graphics on the Core i3 model is just the base integrated solution, but all other models come with a 2 GB GeForce GTX 960M graphics card, which has 640 CUDA cores, 1096 MHz frequency plus boost, and a 128-bit GDDR5 memory subsystem. Dell offers two display choices. The standard model is a 1920x1080 15.6-inch model, or you can opt for the $350 upgrade to a 3840x2106 touch display which has a backlight which can cover the Adobe RGB color space. Dell offers a 500 GB hybrid hard drive as the base offering, and a 1 TB hybrid upgrade, or you can get rid of the spinning disk altogether and choose PCIe based solid state drives, with 256 and 512 GB options. If you elect for an SSD, you also have the option of getting an 84 Wh battery instead of the standard 56 Wh version. The 84 Wh battery takes up the space where the 2.5-inch hard drive would have been, which is a smart idea. Wireless options are interesting as well. The base model comes with a 2x2 802.11ac wireless card, but the upgraded models feature a 3x3 802.11ac offering, which is rare indeed on a Windows PC. This gives a maximum connection rate of 1.3 Gbps, assuming you have a router that can support 3x3 connections. This should, in theory, give a lot better throughput than the more common 2x2 implementations we see on most notebooks, but this is certainly something we’ll test later on. We also see Dell continue to support Thunderbolt 3 ports, which is coupled with a USB Type-C connector. This port provides 40 Gbps of bandwidth when in Thunderbolt mode and can be used for various peripherals including Dell’s own Thunderbolt dock which gives a single cable docking solution. The dock adds Gigabit Ethernet, HDMI, two DisplayPort connections, VGA, three USB 3.0 connectors, two USB 2.0 connectors, headset, and even a speaker output. The laptop itself also has two more USB 3.0 ports, HDMI, and a SD card reader. Overall this is a pretty compelling package. 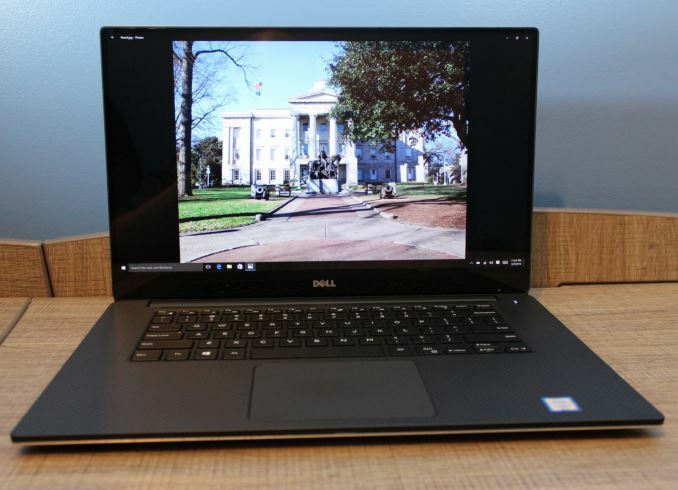 Dell is offering a 15.6-inch notebook which is about the same size as a 14-inch model, but at the same time they’ve found enough space to pack in plenty of performance, along with Thunderbolt 3 and one of the few 3x3 wireless implementation to date. I'm having huge stability problems with this laptop. The problem is Optimus. The only way I've gotten it to be stable, is to use the Dell provided drivers and disable Optimus. I give leeway for photos as I know it's not easy photographing electronics at home if you have no experience but these would look bad even on eBay. Don’t recall feeling that way about any other photo shoot on any IT web review so this is a stand out. Were you just piggy backing on a BIOS/performance related comment with a remark about photography just to get attention? I would say you give no leeway for photos which is why probably you've run out of people who's vacation photos you can criticize and ended up here :). I presume guys who write articles here are paid by amount of words/articles written and not by hours spent with camera and Photoshop. By looking at mostly poor quality of images it does not look like PURCH has given each writer a few grand for camera, lenses, accessories and guys probably just use their own crappy stuff. Since Anand and others have left it looks like there is still big afford to write good quality articles. But other stuff coming with it goes down to hill and there is a very little improvements if any. You have 3 available CPUs, 2 GPU configurations, 2 LCD panels, and different software configuration possibilities but you instantly assume that all laptops exhibit the exact same issues and they will be visible on a demo unit in the days or weeks it's available for testing. The link to the discussion about this issue includes a handful of comments and if you had the common sense to read them you would have seen that plenty of them suggest that it was fixed by using the Nvidia driver provided by Dell. Since this is a review, not a troubleshooting article I suggest you should not confuse it with a manufacturer support page. No Close, all models exhibit BIOS problems. Optimus is just the latest. Before BIOS 19, there were a bunch of other issues. What I was saying was directed to the person claiming Anandtech should have reported this in the product review when clearly it doesn't affect every laptop and also I'm quite sure reviewers only have a narrow time slot to play with the device before it goes on to the next reviewer. And I maintain my suggestion for him since he appears to think such issues should be reported in a product review: the manufacturer's support site is the place to go if you're wondering how a product behaves in the long run. Anandtech is the place to read reviews about a product, standardized tests run on every piece of hardware and some numbers that you can't find on the leaflet. A review isn't made to showcase beautiful photos like some people seem to think (that's the job of the product marketing team) nor to listing a long line of potential issues compiled from support sites and other forums.